The Yankees will celebrate the 20th anniversary of the 1998 World Championship team with a number of events coming up, including a pregame on-field reunion ceremony on Saturday, August 18. The celebration will kick off on Friday, August 17, as the first 10,000 Guests in attendance for the Yankees’ 7:05 p.m. game against the Toronto Blue Jays will receive a 1998 World Championship Replica Trophy presented by F.W. Webb. 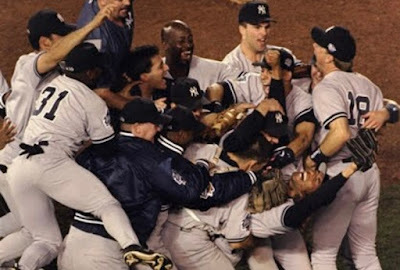 The following day, Saturday, August 18, at noon, there will be an on-field reunion of the 1998 championship team, including Mariano Rivera, Andy Pettitte, Jorge Posada, Bernie Williams, Tino Martinez, Paul O’Neill, David Cone, Darryl Strawberry and manager Joe Torre. Fans are asked to be in their seats by 12:00 p.m. to enjoy the introductions and subsequent ceremony prior to the regularly scheduled game, which will air on the YES Network along with the pregame festivities. In addition to the ceremony, there will be special video messages from former Yankees captain and current Miami Marlins CEO Derek Jeter and 1998 World Series MVP and current Seattle Mariners coach Scott Brosius, who are both unable to attend the day’s events. Yankee Stadium gates will open to ticket-holding fans at 11:00 a.m. The first pitch for August 18 was originally scheduled for 1:05 p.m., and is now scheduled for 1:25 p.m. The celebration weekend culminates on Sunday, August 19, with 1998 World Series Championship Replica Fan Ring Day presented by Betteridge Jewelers for the first 10,000 Guests 14 and younger. Books: "All This I Will Give To You"
Books: The Gripping Novel "The Waiting Room"
Books: "Atticus Finch: The Biography"
Books: "The Life List Of Adrian Mandrick"
Books: Robert Webb's "How Not To Be a Boy"